They were at the door. Her little dog was growling softly. She tried to hush the sound. She knew what they wanted. She felt as though her heart was being ripped from her chest. She had managed to hide her little friend for years. She shared her food and bed with her. She had bought her on the black market. It had cost her dearly but it was worth it. She had been so alone. Nothing to love her or for her to love in return. Her children had grown up and forgotten her. Her husband had died two years before she found Sweetie. Sweetie had been a tiny black and tan ball of fur showing her Yorkshire Terrier background. Of course, she knew that Sweetie could not been purebred. There had been no purebred dogs for years. There were few dogs since the breeders had been slowly and methodically beaten down. When this first started, everyone sat back and said they could not possibly be the breeders they were talking about. After all, they loved their dogs and they were not puppy mills. They would never let themselves be overloaded with dogs. Some of them did not get overloaded nor did they breed more than a litter or two a year. They were smug and secure in that only the puppy mills were being raided. The raids were relentless. They would take place in one state then another. The dog raiders got smarter with every raid. They learned about warrants, the court system, the law in different states and they used whatever means they could to eliminate the breeders of dogs. Some people thought the raiders were dog lovers trying to save the poor mistreated puppies. Some of them were dog lovers, at first. The well-meaning rescue groups were used. The American Kennel Club was used. They would revoke the rights of the breeder who was raided. Kennel clubs were infiltrated and destroyed from within. The very fiber of the dog world was silently unraveled one string at a time. Everyone would rise to arms against every breeder raided. Saying things like that terrible person mistreated those poor dogs; that person had too many dogs; and that person is crazy. If the truth were not provoking enough they would lie and say that person should die. They campaigned by e-mail, petitioned the courts, and used political pull. Even when common sense would tell them that they did not know the facts or circumstances, they persist. They would see fat happy tail wagging dogs and would say abused dogs. They no longer believed their own eyes. The dogs tried to tell the truth but no one could hear them. True, there were cases of abuse, beaten, starved, and sick animals, at first. Then the tide shifted. Good honest dog loving people started to being raided. Any reason was used. Dogs were taken and the owners refused rights to reclaim their dogs. The raiders started to narrow the number of dogs which were in violation. Any person with a dog became a target. Dog grooming became a thing of the past. Veterinarian services were performed out of back room under the dark of night until there were no veterinarians. Dog shows had long disappeared along with the American Kennel Club. Children were told tales of the days when every boy had a dog to run with through fields. The stories of “ Old Shep”,” O’Yeller”, “Call of the Wild”,” Lassie” and all those wonderful stories which would bring tears to the eyes of grown men were being forgotten except by a few. But she remembered as a little girl the small dog who loved her, followed her everywhere, and gave her comfort like no one on earth could give. She just had to find her that special warmth, the grateful lick-kiss, something that loved her unconditional and a reason for getting up in the morning. She found Sweetie. Now they were at her door to take the life that she cherished. The warm little black and tan 3- pound body that loved her as much as she loved it. And there was no one to stop them. ~~~~~~~~~~~~ ~~The old lady with the last dog on earth. In their own words: Revealing quotes from the mouths of HSUS. Please click here to donate to NAIA's programs to fight the HSUS and the end of all animal ownership. 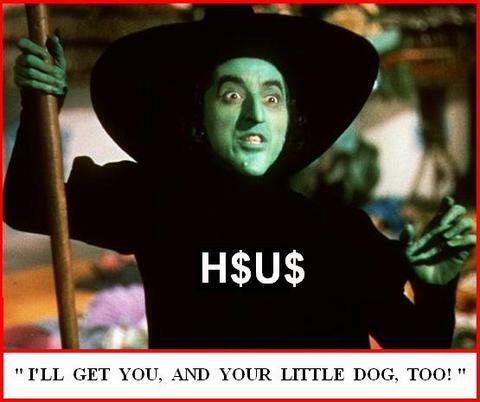 HELP TO "MELT" AWAY THE H$U$ WITCH! BE PART OF THE SOLUTION, NOT PART OF THE PROBLEM!! HSUS is an animal rights group which believes animals should have the same rights as people (erasing the line between people, pets, and livestock and between animal welfare and animal rights), promoting vegetarian/veganism, stopping animal agriculture, and banning animals like cats and dogs from being owned as pets. YES, it's true!